View of Chiyogaike or Chiyo's Pond overlooking the valley of the Meguro River, lying west of what is now the stretch of the Yamanote Line between Ebisu and Meguro stations. Today this area has been built over with multistory apartments. 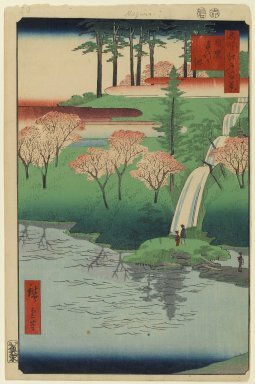 Unusual in this print are the reflections of the trees in the water, showing ensuing Western influences. Still this type of technique was used sparingly and only in three other prints in this series, plates 4, 34, and 91, does Hiroshige indulge in what was to his viewers still a rather exotic effect. The pond appears to have survived until the 1930's and the site today is occupied by the Tokyo Metropolitan Education Research Institute.